Te Papa scientists figure prominently among the 238 researchers who have contributed to a major new publication: The Inventory of New Zealand Biodiversity. 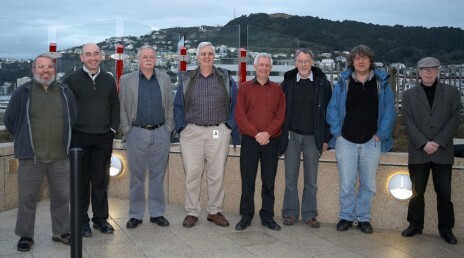 Te Papa taxonomists whose work was instrumental in describing over 80% of the animal groups for New Zealand. Photo Jean-Claude Stahl. Copyright Te Papa. The third and final volume of this 12-year project was launched at Te Papa yesterday, and celebrated the work of scientists from 19 countries, cataloguing over 56,000 species. 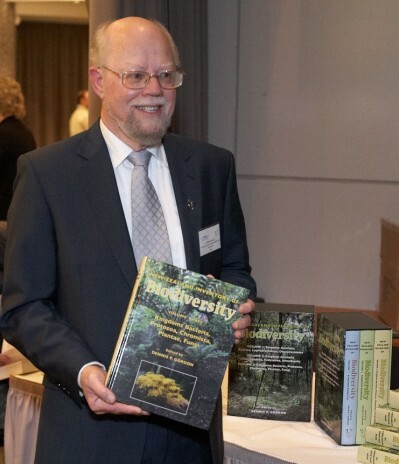 Dennis Gordon with the third volume of the New Zealand Inventory of Biodiversity launched in Wellington 21 May 2012. Photo Jean-Claude Stahl. Copyright Te Papa. The work was brought together by Dennis Gordon from NIWA, with contributions from all major research institutions in New Zealand including Crown Research Institutes, museum researchers such as Te Papa’s Natural Environment curators, and researchers in universities and government agencies. The work is used actively by researchers nationally and globally to describe and catalogue species occurring within the New Zealand Exclusive Economic Zone. For example, the New Zealand Organisms Register (NZOR), the official body which lists names of species occurring in New Zealand uses the Inventory as one of its primary sources of data. Find out more about NZOR. Te Papa’s team of taxonomist are a small but highly effective group, contributing around 20% of the chapters authored on the major animal groups by professional New Zealand contributors to the books. They contributed to chapters that described over 80% ofNew Zealand’s animals. Their work encompasses a very broad range of species, with expertise on animals and plants from orchids to seaweeds, insects and parasites, deep sea fishes and whales to extinct birds. The work is a monument to the collaborative efforts of researchers across New Zealand, and will have ongoing utility in helping us to manage species and their conservation threats, long term. We appreciate the efforts of the institutions and individuals involved, in particular NIWA, Landcare Research, and Canterbury University Press. Find out more information about the publication.